As some of you will know, I’ve got a bit of history with Mustangs! 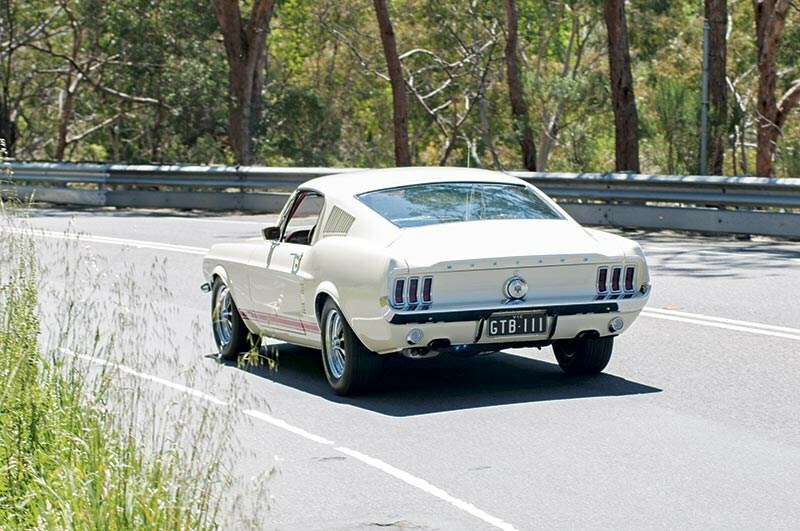 This 1967 GTA fastback is owned by Mark Coffey at Maranello Motorsport and will be familiar to most people as the same model Steve McQueen drove in Bullitt - probably the most famous car chase movie in history. I raced a ’69 and it’s hard to decide which I prefer. 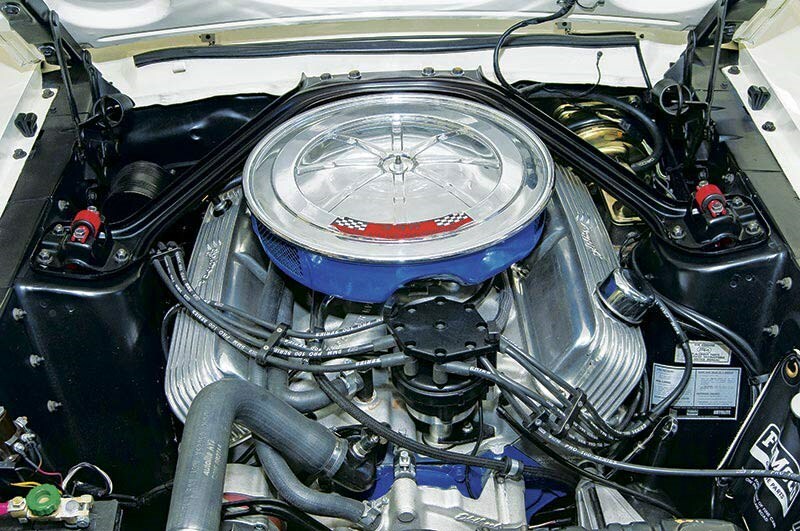 This one’s a big-block, so it has a 390 cubic inch engine. It’s not hard work though. The auto transmission and power steering sees to that and it makes it such a useable car but, more than anything, it’s just a gorgeous-looking thing. To really appreciate this car you’ve got to have some American taste. Drive enough of them and you quickly key into the feel. I’ve driven heaps of them and they’re similar – there’s a broadly familiar feeling that you’ll soon identify. 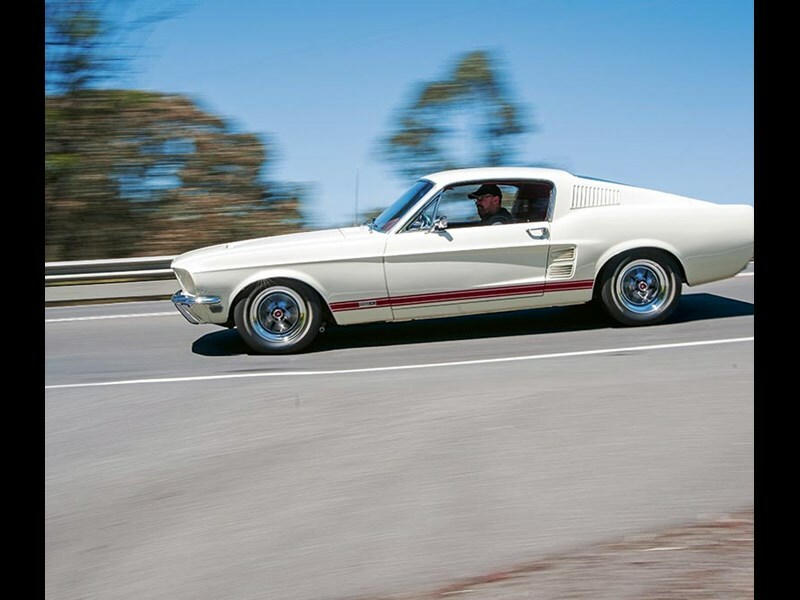 The mass-produced Mustang redefined American cars. 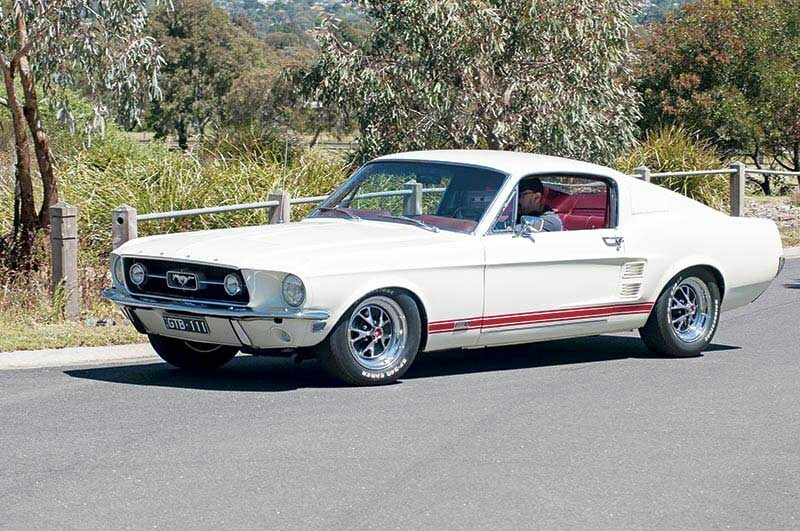 Built from 1964, this was the very first ‘pony car’, and then everyone started making similar type cars. Everyone’s got their personal favourites, but I’ve got a soft spot for this one. By 1967, they’d got a bit bigger, a bit wider, with bigger engines and this surely has to be the best-looking one of the lot. This particular car is beautifully finished inside; it’s still left-hand drive and the original cars mostly drive better, because when people convert them to right-hand drive, they’re often not executed that well. It doesn’t take too much for the subtlety and feel of the car to get lost in translation. I race left-hand drive cars so it doesn’t worry me, but I’ve never liked driving left-hookers on the road. This one didn’t concern me too much because it’s so totally easy to drive. The engine in this car has been worked on by Synergy Race Engines who do the engine work on my racing Mustang, so the engine in this car is much better than how they came off the line. Back then they made pretty good torque but weren’t that impressive in the power department because they didn’t tend to breathe that well. This engine’s had a sympathetic bit of modernisation with the result that it pulls cleanly, has a good throttle response and a beaut sound, as you’d expect. I don’t think it’s purely hindsight that lets us see the potential in these engines. Even back in the day, a whole industry developed to improve them. 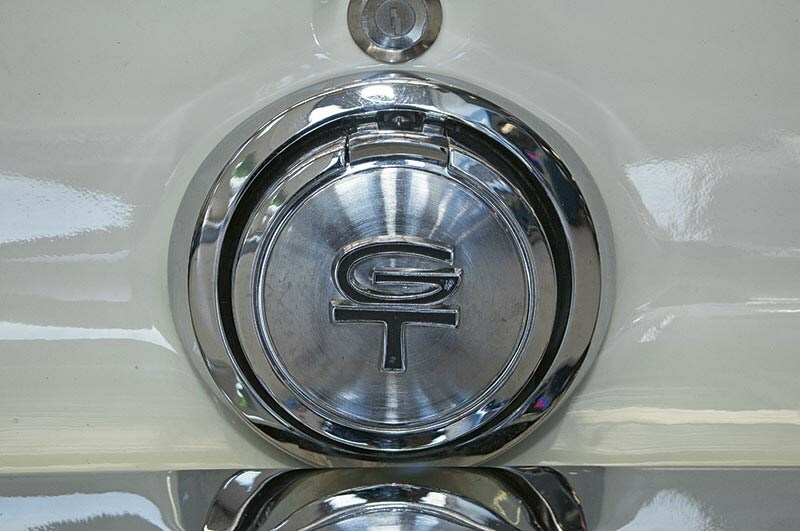 Tuning and performance parts shops were able to thrive, which all helped build the popularity of the pony cars. You weren’t constrained by how it came out of the factory. This one’s probably putting out about 400 horsepower now, which makes it pretty lively. The thing most people seem to overlook is that despite the steel construction and big engines, American cars of this era are actually pretty light by modern standards. 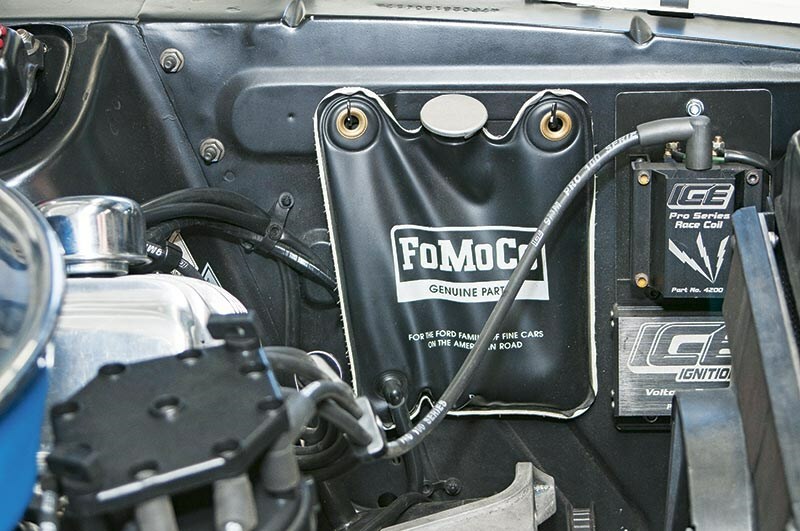 This car tips the scales at about 1,250kg, which is about as much as a modern Mini Cooper S, so you’ve really got some power-to-weight on your side. Today’s cars also have a whole stack of crash testing and NVH regulations to abide by. People want soft-touch dashes and doors that sound like a bank vault when they close them. As a result, cars have just got bigger and heavier. Ford has done pretty well keeping the weight down on the 2015 Mustang, but choose a V8 with an automatic there and you’ll be looking at nearly 1,700kg. That’s about five blokes heftier than this one that you need to accelerate and, more importantly, brake to a standstill. For a car which is getting on for fifty years old, the brakes on this ’67 car are fine for normal everyday driving. 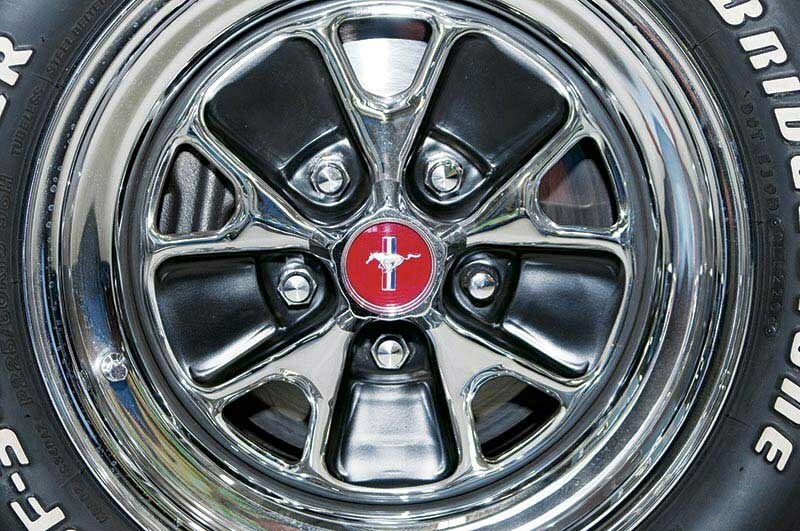 There’s a set of discs on the front and drums on the rear. It also handles well, in a period style. At the time it was built, they handled much better than early sixties cars because the factories had learned a bit about dynamics. The issue I had with it is that the steering is too light. Still that’s no different to most American cars; you need to drive with very calm hands but it doesn’t give you any real feel. The option is to have no power assistance at all, in which case you’d better have a can of spinach like Popeye! American cars retained that over-assisted steering feel right the way into the 1990s. Their roads are pretty good and the cars were built for boulevards, freeways and things like that so, to my way of thinking at least, they could have used a little more heft. You can’t argue with the styling though. 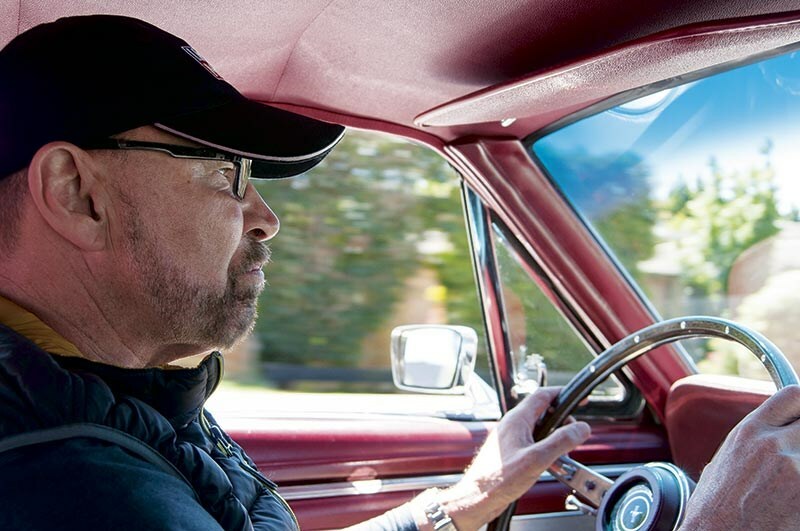 It’s a beaut car and it’s got a lovely interior design; the fixtures take you back to the rock ‘n roll era. Sit in it and you feel like Steve McQueen – so long as you don’t look in the mirror! I had a vintage race-suit made a couple of years ago – and I say to people "This is my Steve McQueen look" – which is about as close as I get! 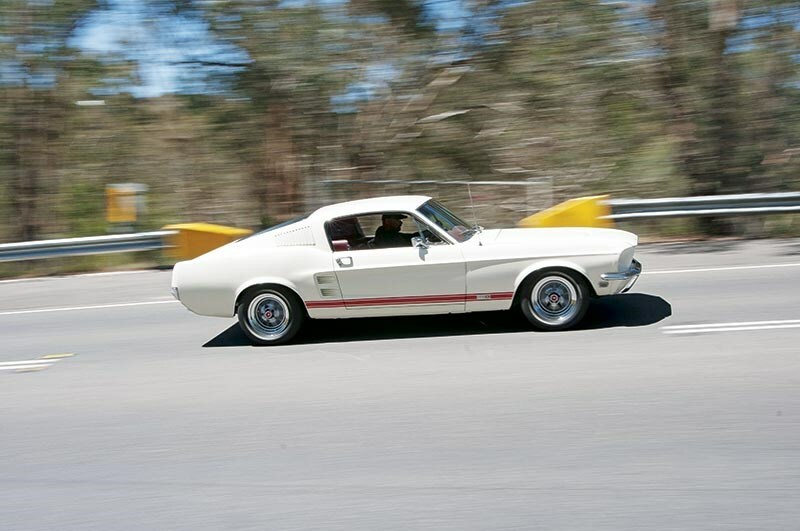 Mark bought it from a guy who’d restored it in New South Wales – and then he spent a small fortune on sorting it, because a lot of people restore cars and in fact all they do is restore the sheet metal and other cosmetics but they don’t make them drive well. In contrast, this car does drive well – it’s been really well sorted out. On a scale of zero to ten, on looks, I’d rate it a ten out of ten: it’s gorgeous. I love white cars so I’m a bit biased, but most of the ’67/'68 Mustangs have been painted green to give them the Steve McQueen look. In terms of driveability, it drives like a nine out of ten car; it’s a very good example. When people are looking for a Mustang, there’s a really huge choice: small block, big block, manual, auto, fastback, hardtop, convertible. At the time, all the manufacturers were forced to play the options game. 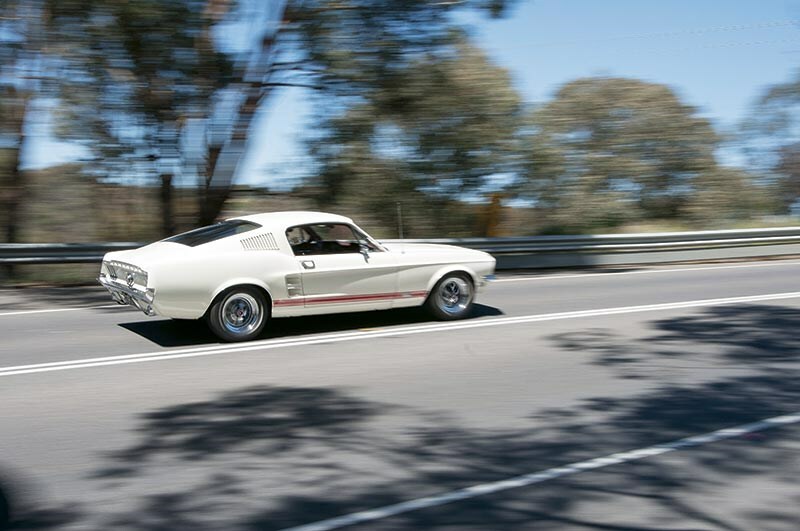 They were hugely popular in America and there’s no shortage of good Mustangs here too – in fact there are probably more Mustangs per capita in Australia than there are in America now. I’ve been invited along to the Mustang Owners Club a few times and they have hundreds and hundreds of members. You only have to look at Unique Cars to see how many people are bringing them into the country. The thing is, not all American muscle cars are particularly useable. Often they’re too big, too valuable or too heavy to make realistic driver’s cars. This pony car is the right side of the line. It’s a lovely example but you really could use it every day. 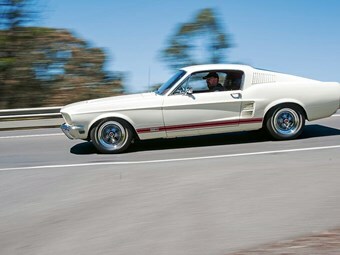 It’s got a good glass area, so visibility is good; more so than the ’69 Mustang. That had a slightly taller dash and they got a bit bulkier and a bit harder to see out of. Although you could use this one as your daily, I think it might lose a bit of its mystique and magic and that might be the worst thing you can do; render it ordinary. It would make a great weekend car for someone – or a wedding car. And that might be the genius of the Mustang. It was a mass-produced car but it still felt special. Long may that last!